Have you asked Neal for your tracking number? I know a lot of USA lights started showing up last week. Yours may still be on the way. Michiel, do you also know something about tax? I don’t know anything about the customs fees or tax for the Netherlands. Maybe someone from there who has already received their light can give us more details about whether they had to pay a tax. Mine came with registered shipping, not DHL, and just slipped through. If they catch it, tax is 21% of the purchase price, plus whatever the shipping company adds as handling costs, in case of DHL in one case that was 18 euro. i dont know how mine is shipped. hopefully mine also slipps through. Bedankt Michiel, Jason. Michiel, do you also know something about tax? I’m also in the last batch so i’m still waiting. But all would be send with dhl now so i hope the declared value will be low enough. In this particular light, if you use high quality protected cells like the 10A ones from IMRbattery, then the only real downside will be cost. Cheap protected cells can suffer other issues like high resistance but that is the cheap protection circuits. It is 100% a copy. I know nothing else about it though. Ordered may 5th no word yet on delivery or tracking ..what do I do next please. You wait a bit longer, no orders from May have shipped yet to our knowledge. Everything was delayed a bit as they ran out of batteries. Using protected cells is more about your understanding and comfort with lithium cells in generally. I personally own 1 protected cell in the house and it was one I got with a review sample. Once again, thank you TA for your help. A driver is what regulates the power between the battery and LED. Electrical current (amperage) is what controls the brightness. A buck driver is a type of driver that takes a higher voltage and regulates it down to a lower voltage. This is the design in the GT. Vf stands for Forward Voltage. In this case, we are talking about an led. This one is complicated. I’ll skip it. GA is the name Panasonic/Sanyo gave to one of their battery models, the NCR18650GA. We tend to say GA for short. Or Panny GA. The Panasonic NCR18650B is called the Panny B for short, etc… The full name is too long to write. Regulation has to do with the Buck driver design. If you feed it with enough voltage above a certain point, 14.8v in this case, it will maintain a steady output current. 4 fully charged 18650 in series (4.2v each) delivers 16.8 volts. As power is used up from the battery the voltage will also start to drop. Also, as you put a load on the batteries the voltage will sag down a little. Some battery chemistries tend to sag a lot, some a little. The added protection circuitry also tends to add resistance which can cause the voltage to drop more than if it were unprotected. So as long as the driver receives 14.8 volts or above, it can deliver the full 2.5A output to the emitter. This is called regulated output. Once the driver voltage gets below 14.8v, then the 2.5A starts to drop. So the steady brightness level will start to taper off. There’s a lot more to it, but that is the basics. Are you/anyone comfortable /willing to speak to the CONs of using protected with this particular lamp? What shortcomings will be seen by using protected? Lower lamp output? Less run time since these cells “fall out of regulation” sooner? Again, for those playing along at home, this lamp will be used with 8 cells in the standard, long tube. I think you are wrong in lumping together all protected cells. You can’t really do that as the basic cell under the wrapper can have different characteristics. Plus the particular protection circuitry, which is added by a third party, can also very quite a bit. As you can see here, the added protection circuitry definitely causes an added voltage drop on a 3A load. 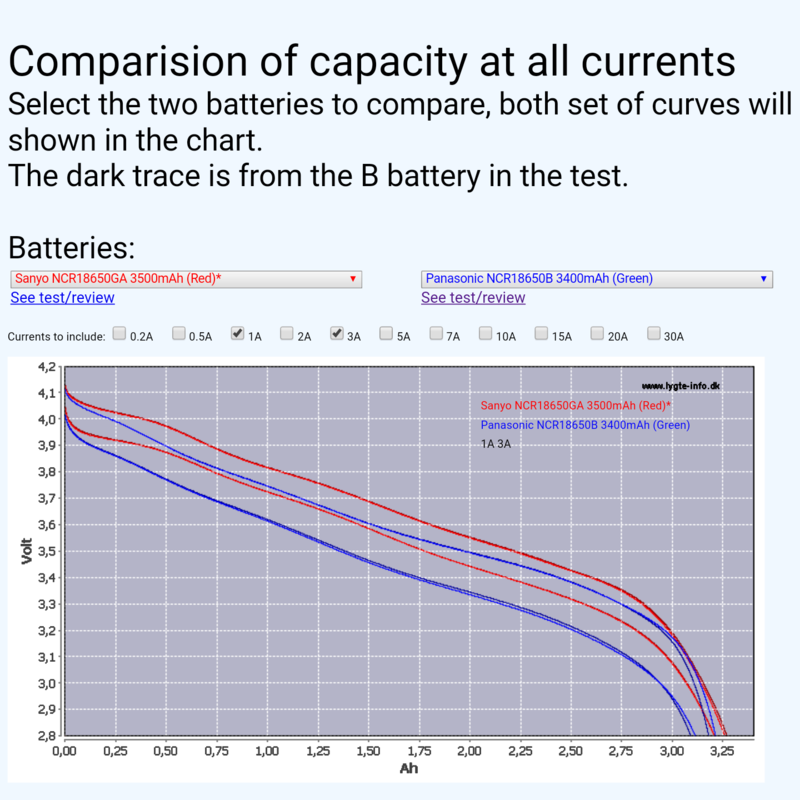 Here is a test HKJ did on an unprotected Panasonic NCR18650B 3400mah and a protected Panasonic NCR18650B 3400mah. Note that the protection circuit, with it’s increased resistance, always causes the voltage to sag lower. This always reduces performance in a FET driver, hot rod type of light. I would not think it would have any effect in a buck driver design. Maybe it does? The bigger thing to notice is that even without the protection circuitry, the Panny B just seems to have a lot more voltage sag under load compared to the Sanyo GA (and LG MJ1). This also got me to thinking about the B and GA cells. They are both considered really good. I have a few of both. HKJ tested both (unprotected) and the results are kind of surprising. The 3500 had much less voltage sag under load. In certain lights this can give the 3500 an advantage. Interesting. In the case of ChibiM, he got a triple whammy. Panny B cells, protection circuitry and only one carrier. The voltage to the driver probably dropped to under 14.8v within seconds of turning on Turbo, hence the reduced output. When he used both carriers, reducing the load by half, it will take a bit longer before it drops out of regulation. 5 mins? 10 mins? Hard to say. So I think we all learned something here. If you want to use a protected cell on the GT, you can. Just don’t use the Panny B, use the Sanyo GA or LG MJ1 as they have much less voltage sag. These two will allow the GT to stay in regulation much longer than the Panny B. Post 101 here shows how the GT performs with four batteries only. 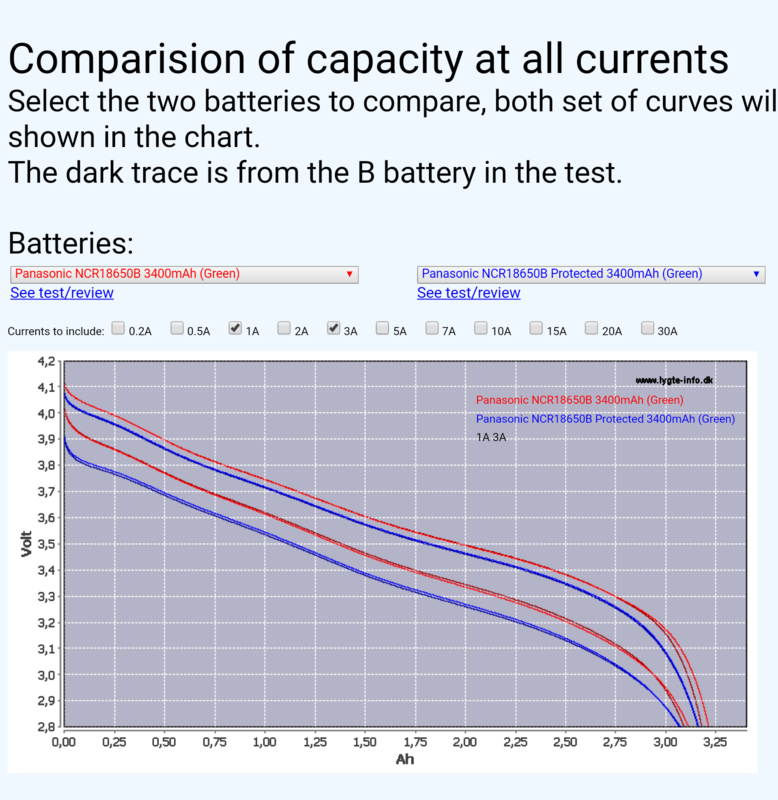 30Q and KD 3500 protected batteries were used in the comparison. I try to follow along but I would do nothing but read this thread to keep up 100%, Sorry if my post was out of place. Too bad Astrolux loves to over spec their flashlight. That is another HUGE difference between Astrolux MF04 and Lumintop BLF GT. I don’t side with any manufacturer, fact is fact and it hurts. Not sure Lumintop had over spec their previous products or not, but this BLF GT was properly designed, tested and reviewed before releasing to buyer. Astrolux should do that by sending out review samples. We didn’t talk very much about it in the GT thread because it’s sort of a competitor and it would be considered rude towards Lumintop to discuss it here. That’s all. There are plenty of discussions about it on other blf threads. I was meaning to ask you, I don’t know what KD 3500 batteries are. Are those the Sanyo GA’s? Heres the info on them. That’s what I thought. They are GA’s. On the latest MF02 the current was set to 2.7A, personally I prefer to set it down to 2.4-2.5A by a resistor mod. The modes are 15-35-1700-2700. On the 1700 mode the runtime will be longer and the range should be pretty good, the same or greater than on a GT on the 2A mode. The only drawback on the MF02 is the quality of the reflector which has a little op surface like so I suppose that the MF04 will be the same. On the latest MF02 the current was set to 2.7A, personally I prefer to set it down to 2.4-2.5A by a resistor mod. The modes are 15-350-1700-2700. On the 1700 mode the runtime will be longer and the range should be pretty good, the same or greater than on a GT on the 2A mode. I don’t see how “1700 lumen” on the MF02 would be as bright as the GT at 2A. From 2.5A to 2A you only loose maybe 200-250 lumen. For Astrolux to say it is a 1000 lumen drop, the amp range is probably about 1.2A to 1.3A maybe? Definitely less than 2A. Has anyone measured all the brightness levels on the latest MF02? BTW, Banggood still shows the MF02 Turbo to be 3000 lumen. The MF04 is showing 2700 lumen. We are just being nit picky, I think. People can buy what they want. Range and brightness are two different things. MF04 has a bigger reflector so RANGE could be the same. I ordered one so I will tell You more when I get it. I’m curious did LT/ Neal send lost orders.